G2Link is a new platform enabling businesses – from startups to the enterprise – to manage their business reputation. By harnessing peer to peer knowledge, G2Link collects accurate data allowing you to manage your business risk. With G2Link, you’ll be able to research and rate companies, read and write business reviews, monitor business relationships, create company profiles, receive updated company alerts, and more. 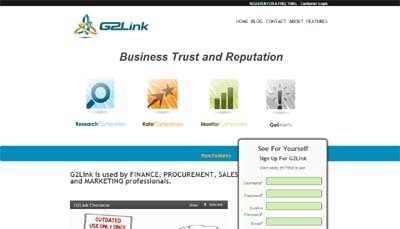 G2Link is designed for business professionals. Users will no longer have to rely on outdated one time business data from expensive and ineffective credit bureaus and other third parties.